Wow! Some of those cards are ones that I believe will take off in the near future. Not only are there a lot of rares in the deck, but instead of most being bulk, they are solid and will probably see Standard play at some point in the future. Not only do the rares of the deck add up in value to make it worth more than the MSRP of $25, but there are several cards in the deck that I believe are great speculation targets that will increase in price in the coming months as they are adopted into the new Standard environment. If any of these cards see an increase in price over time this event deck will be a great deal. To make things even better these are just the rare values! Cards like Banisher Priest or Dryad Militant are included as well, which is additional icing on the cake and incentive for picking up this event deck. Ashiok, Nightmare Weaver – Todd Anderson was talking about Ashiok and how underrated the card seems to be in Theros Standard. While I don’t necessarily agree with his analysis, it is hard to disregard the comments of a professional player that has more top 8’s and wins than I can count on two hands. I myself am certainly not a pro at magic, so when it comes to speculating on cards, I believe that listening to professional players is a great way to understand a card’s potential impact in Standard. Listening to experienced players also can confirm a gut feel that you initially have about a card. I admit, my initial reaction to this card was “total garbage”. While I still don’t think that Ashiok can command a price that is over $10 for very long, when Ashiok dips down into the price range where I feel comfortable buying in I won’t hesitate to do so. At the very least, this card will have an immense casual appeal that will keep the price from dipping too low. If it does take off in Standard, I can at least say that I did my due diligence and listened to people that are actually good at the game. When you’re humble enough to listen to sage advice from the pros there is often profit to be made. Firedrinker Satyr – My opinions of this card teeter back and forth constantly. On the one hand, you will be completely blown out by this card if you are facing down a Boros Reckoner or a burn mirror. Jackal Pup replacements seem to have been outclassed by all of the creature power creep that has hit Standard over the past few years. 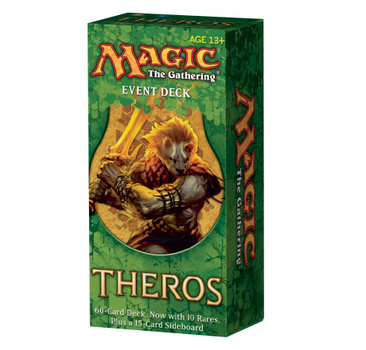 Yet, at the price that Satyr currently stands, I feel comfortable picking up at least a playset to see what happens. Any deck that would play this card would play it as four of in the main deck. If the hype around the card by players such as Craig Wescoe and Taylor Gunn ends up being real, the risk of $1.50 would have definitely been worth it. 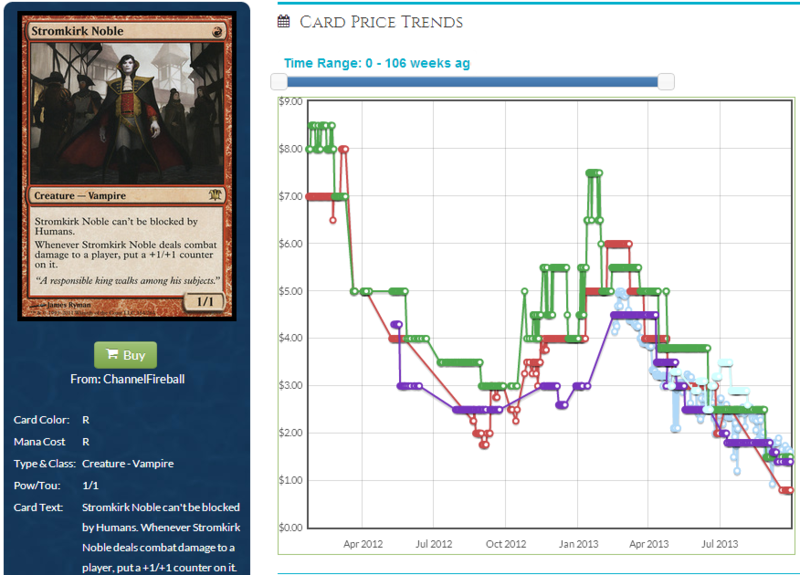 The price ceiling on Firedrinker Satyr could turn out to be exactly like Stromkirk Noble’s, which saw prices upwards of $8 when it was popular in Standard. There is a ton of potential profit there! Steam Augury – Again, like Firedrinker Satyr, my initial opinions of this card placed it as better than Divination but worse than all other rare or mythic card draw in Standard. A Fact or Fiction where you make the piles is not as powerful as when your opponent is forced to make the piles for you. Basically, any card that involves a choice where your opponent gets the last option seems worse for you than you may initially anticipate. After doing some research I found that Craig Wescoe, Gerry Thompson, and Melissa DeTora had some good things to say about Steam Augury, both in the control shell and aggro/control. It turns that out even when a Fact or Fiction is reversed, there is still a fair amount of skill involved with choosing the piles. Based on your deck build, you can still create the piles in a manner that will be advantageous to you when you resolve Steam Augury. Given the hype on Steam Augury, $3 could make it a target worth considering. Again, I recommend you pick up your playset and then see what happens when the card is actually put to the test. I’m not sure what the ceiling on this card could be, and I don’t want to be the guy that compares it to Sphinx’s Revelation or Gifts Ungiven, because it certainly is not as powerful as those cards. Fact or Fiction is the closest comparison, and that card was a Standard powerhouse back in the day, but like I said prior I would not call it an even comparison because your opponent has the final say. Tread with caution as speculation target. Spellheart Chimera – I think that in the long run this uncommon has a lot of potential to be a casual hit. In terms of Standard, the card is definitely a build-around-me card that will require its own deck to shine. I see people playing this card in conjunction with Young Pyromancer and tons of burn spells to create an aggro/control deck similar to past Delver lists. I recommend picking up a playset, as well as trying to grab them as trade throw-ins because they will hold casual appeal for a long time.